The signature product of Horsepowder, Inc. It is a daily grooming product which acts as a dry bath. 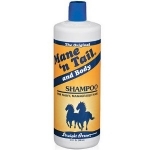 Just brushing it on your horse's coat cleans and deodorizes the coat. It's alkaline properties defends against any fungal infection and actually eliminates common coat fungus like rain rot. Dires sweat and cleans dirt! Use as a preventative (and anti chafing) under pads, wraps, boots and blankets. Also keeps helmets odor free...sprinkle some in and dissipates on contact! The formula is a modification of a successful natural deodorant manufactured by Bausc, Inc, a non-toxic human skin care company. 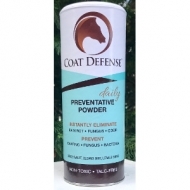 After dramatically positive results of an accidental hunch, our two founders together for further refining and testing of the product, Coat Defense® was foaled! 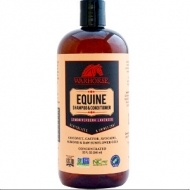 Warhorse Equine Shampoo & Conditioner 32 Oz. Non GMO, no pesticides, metals, glyphosate.